What does Russian President Vladimir Putin want to achieve through Russia’s participation in BRICS? This report addresses both Russia’s overall approach to BRICS as well as its specific goals during its chairmanship of BRICS this year. It will address the following questions. What strategic goals – geopolitical and economic – does Russia pursue through its participation in BRICS? How does Moscow pursue those goals through BRICS? Does Russia use the association to achieve certain goals in bilateral relations with BRICS’ members? Has it achieved anything in bilateral relations with BRICS’ members beyond what might have been accomplished without the association? What are Russia’s goals and strategy for its 2015 chairmanship? What goals might Russia pursue for BRICS beyond 2015? Russia pursues a series of interrelated long-term strategic geopolitical and economic goals through its participation in BRICS. In March of last year President Vladimir Putin emphasized the goal of transforming BRICS “from a forum for dialogue into a fully formatted mechanism for strategic interaction.” Russia’s “Concept for the Participation of the Russian Federation in the Association ‘BRICS’,” approved by President Putin in March 2013, lays out Russia’s vision for BRICS and its future cooperation with the association. BRICS’s importance in the structure of Russian foreign policy is reflected in the Concept: “The creation of BRICS, initiated by the Russian Federation in 2006, was one of the more significant geopolitical events of the beginning of the new century. This association was able in a short time to become a major factor in world politics.” Although the veracity of the last assertion is dubious at present, there is no doubt that Moscow hopes to make BRICS a major factor in international affairs, serving Russia’s multi-vectored foreign policy and its goal of creating a multipolar international system. Russia has at least eight strategic political and economic goals it pursues through BRICS. Russia’s first and most fundamental strategic purpose for BRICS is as a mechanism for Russia to maximize and project globally Russian economic and political influence and power. The association creates opportunities for Russia to develop economic and political partnerships with global reach, strengthening Russia’s global presence through “non-institutionalized” global “management” and “network diplomacy” based on cooperation with the world’s key regional powers in Asia (China and India), Africa (South Africa), and South America (Brazil) placed on each continent (excluding Europe and North America – i.e., the West) and in numerous international associations and organizations. These goals drove Moscow’s initiative for BRICS, expanding BRIC by way of South Africa’s inclusion. Second, by including only non-Western powers from across the globe’s continents, BRICS facilitates Russia’s geostrategic goals of creating a multipolar world. This geostrategic goal of pluralizing the international system’ structure through BRICS is mentioned in both Russia’s BRICS Concept and Foreign Policy Concept. Undermining the international system’s monopolarity under ‘American hegemony,’ serves Russia’s third strategic goal: hindering efforts by the U.S. and its Western allies to delegitimize Russian domestic and foreign policy. 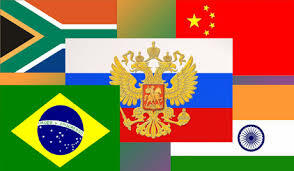 Although as one observer has noted the BRICS countries have little in common, differing widely in their cultures, politics, economics, and demographics, Russia’s BRICS partners have one important common trait – they are non-Western or non-European and are former colonies of Western powers. Fourth, Moscow seeks to strengthen stability by using BRICS to strengthen the principles of state sovereignty, territorial integrity, and non-interference in the internal affairs of states in response to what it interprets as Western efforts in support of separatism and regime change, as exemplified by in Yugoslavia, then Serbia and more recently in Libya and Syria. Fifth, BRICS is a PR vehicle for projecting an image of a new Russia as a normal country to the East, West, North, and South. Russia seeks to strengthen and expand its “linguistic, cultural and informational” presence and influence around the world in service of the ends mentioned above and below. Economically, Russia’s first goal is to utilize common and complimentary aspects of the members’ economies to promote economic development in Russia and other BRICS’ member-states. Second, Moscow seeks to marshal BRICS to push for reform of the international currency and financial systems so they become more broad-based, stable, and effective from Moscow’s perspective. The Kremlin might even view BRICS institutions such as the association’s Development Bank, agreed upon by the members at the March 2013 Fifth Summit in Durban, as a potential, future competitor of the World Bank and International Monetary Fund (IMF) for bolstering the international system’s multi-polarization. Third, Russia seeks to leverage its participation in the association in order to develop “privileged bilateral relations” between the association’s member-states, in particular Russia’s economic, trade and investment ties with each other BRICS member. As in politics, BRICS helps Russia overcome its relative economic isolation from the West. Like the Customs, Union, the Eurasian Economic Union and the Shanghai Cooperation Organization, BRICS is a mechanism for the pursuit of trade and other partnerships and overall economic growth and development that is independent of the West and its demands regarding human, civil and political rights. Moscow views such demands as a Western mechanism for isolating Russia, limiting her economic and political potential, and ultimately preventing Russia’s re-emergence as a great economic and geopolitical power. How will Russia pursue its strategic political and economic goals through BRICS? Moscow’s implementation strategy will be to use international and regional organizations – most important among them, the UN – and bolster within such organizations the role of the BRICS member-states. Thus, Russia’s BRICS Concept proposes expanding the UN Security Council’s membership, presumably to include those BRICS members without a seat on the Council: Brazil, India, and South Africa. This is to be done, the document emphasizes, while preserving the permanent members prerogatives, including their power of the veto. In this way, Putin appears to believe that Russia and its BRICS partners in the UN and Security Council can block policy courses aimed at regime change and the unilateral and coercive resolution of conflicts. Thus, Russia intends that after agreeing on joint policy positions, BRICS members will also introduce proposals to the UN General Assembly and the UN’s specialized bodies and institutions in order to strengthen to role of international law in global affairs and counteract what it sees as tendencies to muddle principles in international law, arbitrarily interpret UN Statues and Security Council resolutions, and politicize human rights issues. In order to secure agreement between BRICS members regarding their joint action in international organizations, Moscow will support the creation of “a system of mechanisms” for foreign policy cooperation between BRICS’ member-states, including regular meetings of their foreign ministers, senior officials of foreign policy departments and experts and close cooperation between the BRICS’ permanent representatives in the UN and other international organizations. A similar approach is to be taken in the World Trade Organization (WTO), the Group of Eight (G8), the Group of Twenty (G20), the Asian-Pacific Economic Community (APEC), and other international organizations, associations and fora. In sum, excluding military issues, Russia is using BRICS as a mechanism for exerting Russian influence in every sphere – political, economic, social and cultural – globally through both Russia’s relations with BRICS as a whole and its relations with individual BRICS members on a multilateral and bilateral basis. Russia will likely use the July 2014 BRICS Summit to set the agenda for its chairmanship of the association scheduled for 2015. Judging by the length and detail devoted to all the various spheres in Russia BRICS Concept, Russia’s agenda for the upcoming summit and its chairmanship will focus on achieving specific goals in three priority issue areas and to a lesser extent in a series of secondary spheres. The three priority issue areas will likely include: international security, international currency and financial policy, and scientific and technological development and innovation. In international security, Moscow excludes, at least for now, the use of BRICS to address “issues of military-political character or the creation of a mechanism for military cooperation.” Indeed, BRICS is not mentioned in either Russia’s ‘National Security Strategy through 2020’ adopted in May 2009 or its February 2010 ‘Military Doctrine’ adopted in February 2010. According to Russia’s CRICS Concept, Russia will seek to coordinate the BRICS states’ positions on issues of strategic stability, terrorism, non-proliferation of weapons of mass destruction (WMD), and regional security and resolution of regional conflicts. Regarding terrorism, Moscow wants to working out united or at least similar approaches to international terrorism, strengthen of the UN’s counter-terrorism coordinating function, and facilitate implementation of the UN’s Global Counter-Terrorism Strategy, universal anti-terrorism conventions, and strict observation of relevant UN resolutions. Russia may propose where possible developing BRICS counter-terrorism cooperation with Muslim countries through the Arab League, the International Islamic Conference, the African Union, and other regional organizations. Moscow is likely to propose joint policies to counteract criminal, financial and money-laundering, and Internet or ‘informational’ support for terrorism and implementing them through relevant international conventions, groups of countries (in particular, the Group for the Development of Financial Measures to Fight Money-Laundering), as well as bilateral efforts. In his annual presidential address to Russia’s Federal Assembly on December 12, 2013 Putin said that Moscow would focus on “global problems” such as the “strengthening non-proliferation regimes, combating international terrorism and drug trafficking” in its capacity not just as 2014 president of the G8 but as host of the 2015 BRICS summit. Thus, it appears Moscow is preparing to somewhat ‘securitize’ BRICS by establishing it as a mechanism for addressing international and Russian national security issues. However, it will do so without ‘militarizing’ or bringing in military issues into the association for the present time unless, perhaps, some extraordinary security contingencies suggest BRICS be utilized in such a way. In this way, Moscow could be positioning itself to become a mediator in disputes between China and India; something that would promote Russia’s international and regional status and maintain BRICS as a viable association that might be upgraded to address security and in future even military problems on the model of the evolution of the Shanghai Cooperation Organization (SCO). Perhaps even more than security issues, as Russia’s BRICS Concept and Russian officials’ recent articulations suggest, currency and financial concerns will be a central focus of Moscow’s activity within the association. The Concept stipulates that Moscow will use BRICS to pursue the global economy’s “stable and balanced” growth through “reform of international currency and financial system in order to create a more representative, stable and predictable system of international reserve currencies.” Specifically, BRICS should push for: the completion of reforms of the IMF in a timeframe and on conditions agreed upon with the G8 and IMF; the creation of mechanisms for the reducing the risk to the BRICS member-states of a currency devaluation connected with the mass transnational movement of capital; the G20’s promotion as to become the main economic cooperation forum for its member-countries, including BRICS’ member-states, which suggests its subordination to the G8 at least on economic issues; and increasing the use of BRICS member states’ national currencies in settling mutual accounts and in financial markets. Most importantly, it is likely that Moscow will insist that BRICS lobbies the IMF so that at a minimum the Russian ruble and Chinese yen become alternative reserve currencies, and at a maximum or in the longer-term it could propose that all of the BRICS member-states’ acquire such status. In sum, Moscow hopes to use BRICS in order to make more the international monetary and financial order more polycentric, in particular through lobbying by BRICS in the G20. Either Russia seeks to undermine the dollar for both political and economic reasons, or it fears that recent U.S. penchants for out-of-control spending, increasing indebtedness, and rampant printing of the dollar under ‘quantitative easing’ demand reducing Russia’s and the global monetary and financial systems’ dependence on the American currency. One of Putin’s top economic advisors, former Minister of Economy and Trade Sergei Glaziev seemed to point to the former motivation when in the December 2013 issue of Russia in Global Affairs he called for BRICS to abandon the dollar and euro as reserve currencies in order to halt Euro-Atlantic integration’s “clear imperial ambitions”: “This integration continues and will continue as long as other world players agree to finance it, accepting the dollar and the euro as world reserve currencies. Should BRICS countries give them up, the whole Euro-Atlantic expansion, based on military and political coercion, will stop in a flash.” Less temperate members of the Russian elite might urge Moscow to put forward only the ruble as an alternative reserve currency, but they are likely to fail as Putin must realize that he cannot endeavor to organize multilateral efforts on a unilateral basis, especially when dealing with Beijing. In order to coordinate a common BRICS approach to international and internal BRICS monetary and financial issues, Moscow proposes convening regular meetings of BRICS’ finance ministers, central bank directors, G20 ‘sherpas’, and experts on urgent issues related to its and BRICS’ monetary and financial goals. The primacy of concerns about monetary and financial risk in Moscow’s calculus is suggested by its push at the 2013 G20 summit to conclude a BRICS agreement on creating a $100 billion currency stabilization fund. Russia’s idea for the Currency Reserve Fund, which is to include $100 billion (with capital contributions China – $41 billion; Brazil, India and Russia each – $18 billion; and South Africa – $5 billion), comes from its domestic Stabilization Fund established by Storchak’s former supervisor, former Russian Finance Minister Aleksei Kudrin. Just as the Stabilization Fund was intended as a reserve for dealing with periods of economic and/or financial instability, the BRICS Currency Reserve Fund is intended to adjust the value of any BRICS member-state’s currency in the event of sharp fluctuations in currency reserves and values created by massive transfers, sales or purchases of currencies or a reduction of Washington’s ‘quantitative easing’ policy. The fund will perform currency swap operations (SWAP) to supply dollars into a BRICS country in exchange for its national currency in the event of such an imbalance. Funds should be supplied to countries, according to Moscow, in accordance with their ability to reimburse them under a set timetable. The BRICS member-states’ national banks will participate in the fund using their national reserve funds which should include funds from the state budget and tax payments. It is possible that Moscow will propose growing the size of the fund at the next BRICS summit. Other than the figures on the size of fund contributions from each country, Moscow has not indicated any expectations it has of China. Among all the economic and cultural sectors in which Moscow seeks cooperation within BRICS – including economics and trade, industry, agriculture, language, culture, and education – the science, technology and innovation sector (STI) will likely get top priority. It will be seeking at the July summit to lock in measures for long-term, joint cooperation among the BRICS states to address problem areas among the member-states based. This is to be accomplished, according to Russia’s BRICS Concept, through the exchange of science and technology (S&T) policy and program information and joint research in spheres that will require and drive innovation. Such spheres include: space technology, aeronautics, high-speed transportation, microelectronics and information technology, nanotechnology, food security, biotechnology, veterinary science, medicine, basic research, natural resource search and discovery, geospatial mapping, climate change, water and water purification technologies. Specifically, Moscow will likely propose: the formation of a BRICS working group for determining areas for cooperation in space and space technology; the creation of joint high-tech zones (science parks), incubators, common “technology platforms”, and high-tech research and innovation centers such as Skolkovo in BRICS; the stimulation of joint BRICS investments in the development of high-tech research and innovation centers such zones, parks, incubators, platforms and centers; broadening cooperation in the education and training of scientific personnel and joint research projects; and establishing mechanisms for continuous STI cooperation to include meetings of senior STI officials and a “network of national coordinators” for STI cooperation. More generally, Russia’s BRICS Concept declares Moscow’s support for developing STI cooperation not only within the association’s format, but also within smaller multilateral groups, including those that would include non-BRICS members. Again, Russia’s BRICS Concept proposes expanding cooperation within BRICS in every possible sphere imaginable: economy and trade, industry, energy, agriculture, language, education and culture. Nevertheless, after the three top priority spheres detailed above, the Concept’s contents suggest Moscow is likely to seek greater economic relations more than cultural ones. Among the ‘low-priority’ economic spheres, it will devote special effort towards expanding trade and investment on both multilateral and bilateral bases with BRICS members. To achieve investment goals, Moscow appears especially keen on getting the BRICS Development Bank up and running as soon as possible. Russia’s point man for Russia on these issues is Deputy Finance Minister Sergei Storchak. His latest statements on these issues reveal the following. Moscow sees the Development Bank’s main function to be the financing of joint investment in infrastructure projects in the BRICS member-states. The BRICS agreements at the last G20 summit in St. Petersburg are seen in Moscow as having completed the first of two stages leading to the BRICS Development Bank’s official founding, which Moscow aims for in 2015. St. Petersburg accomplished the first stage’s tasks, including agreement on the general tasks of the bank and on the authorization of equity capital of $50 billion ($10 billion from each of the five BRICS members) with an initial equity contribution of $10 billion ($2 billion from each of the five BRICS members). Given Moscow’s goal of opening the bank in 2015, the second stage in 2014 would presumably involve final preparations for opening the bank, including the transfer the equity funds and capital to the bank. There have been no official Russian statements on Moscow’s preference regarding the bank’s location. It cannot be excluded that Putin will propose that the bank be organized an Internet-based operation. Moscow will also propose: strengthening the BRICS’ Stock Market Alliance; the formation of a BRICS Business Council and BRICS rating agencies in order to achieve a “more objective rating of national companies and the market position of banks in the BRICS member-states;” regular meetings of the member-states’ economy and trade ministers and leaders of their statistical and monitoring agencies; and stronger cooperation among the BRICS states’ permanent representatives in the WTO; and greater activity of the BRICS contact group for the preparation of proposals for the development of economic cooperation. Moscow plans to focus its efforts towards greater economic, trade and investment cooperation within BRICS in the energy and industrial sectors, with priority within these given to broadening export potential for the national aviation, energy, energy machine-building, metallurgy, pressing machines, radio electronics, transport, and special machine-building. In addition, Moscow will propose strengthening BRICS member-states’ cooperation in the following areas: cooperation in international organizations covering trade issues (WTO, APEC, etc. ); competitiveness policy; exchanges of statistical data; the achievement of functional standards; and the production of joint publications on economics and trade. Other second-tier spheres of cooperation include agriculture, language, culture, sport, youth affairs, regional affairs, cooperation between non-state organizations, and mass media. Although the development of bilateral relations does not appear to be Russia’s priority in its participation in BRICS, it certainly is a component of Russia’s approach to its participation in the association, which is seen as opening up greater contacts and cooperation with the leading powers on each of the non-Western continents. In Section III.12 of Russia’s BRICS Concept lists the development of “privileged bilateral relations” among the BRICS states as the fourth of five “strategic goals.” Moreover, Section III.13 emphasizes that Russia’s relations with the association should not replace bilateral relations, since “friendly bilateral relations” with each of the member-states was the basis upon which BRICS was able to be established. In other words, one of the strategic goals of Russia’s participation in BRICS is to increase its bilateral connections and thereby its overall relationships with each BRICS member-state. It is still somewhat early in the history of BRICS for us to conclude that Russia has made gains in and benefits from its bilateral relations with its BRICS partners that it would not have achieved if BRICS did not exist. Aside from the data shortage left us because of the brevity of BRICS’s existence, there is no perfect methodology that would allow one to assess whether something that has occurred would not have been possible in the absence of a single factor. Perhaps we could reach the conclusion that the association facilitates closer bilateral relations between Russia and its BRICS partners, if all of those relationships improved while at the same time Russia’s relations deteriorated with all or almost all other countries. We could reject a positive ‘BRICS effect’ on bilateral relationships, if there is a decline in Russia’s bilateral relations with all BRICS members. Thus far, the results are not conclusive. However, Russia recently has been achieving some gains in its bilateral relationships with the BRICS member-states that might be indicative of accomplishments that would have been less attainable without BRICS. Those results allow at least an initial rejection of the view that BRICS is harming Russia’s bilateral relations with the association’s members. Examples of recent bilateral gains include several Russian trade agreements and even security-related partnerships with individual BRICS states. Those with China are well-known to readers and need not be reviewed here. Russian-Indian talks are underway on adding nuclear power plant units at Tamil Nadu, building oil and/or gas pipelines from Russia to India, and joint energy resource exploration. There is also an agreement between Moscow and New Delhi to cooperate in helping secure Afghanistan after US-led forces are drawn down by reviving a weapons and munitions factory in Kabul, and in November India expressed its support for Russia’s call for developing a joint Shanghai Cooperation Organization position on Afghanistan. Some in India expect Russia to be the likely winner of India’s recent tender for six stealth submarines worth $8 billion. With South Africa – a BRICS member for only three years – Russia’s state nuclear energy company, RosAtom, signed a major, long-term, and comprehensive agreement in January on the development of South Africa’s entire nuclear energy industry. RosAtom will develop this sector for Johannesburg by organizing the construction of eight nuclear power plants, training of their personnel, financing, and the provision of the nuclear fuel. With Brazil, Russia’s relations have been limited to agricultural agreements on Brazilian port exports since the formation of BRICS. However, last year Brazil expressed interest in importing 1 million metric tons of wheat from Russia annually. Moreover, during his February 2013 visit to Brazil Russian Prime Minister Dmitry Medvedev announced a goal of reaching $10 billion in Russo-Brazilian trade turnover, which stood at $6.5 billion in 2011. In particular, Medvedev proposed joint projects in industry, agriculture, space, and energy, including nuclear energy. A Russian delegation member mentioned Russia’s plans to participate in a tender to build four nuclear plants in Brazil over the next three years. These proposals speak of Moscow’s ambitions with regard to trade relations with BRICS’s member-states. Rio de Janiero’s plans for a major privatization program and railroad construction suggest Moscow might seek to pursue participation in those projects. Putin’s plans for BRICS development include institutionalization, politicization, and expansion. In the next three to four years, Russia intends to concentrate members’ efforts on: (1) fully developing BRICS in its present composition; (2) forming a system of informal mechanisms on the political and working level aimed at strengthening coordination in all issue areas, securing the continuity of the association’s work during the rotation of the chairmanship, and activate dialogue on new ways and forms of cooperation; (3) developing a strategy for BRICS’ development defining its long-term goals, principles of its activity, and mechanisms for cooperation; (4) begin a dialogue on ways, tempos, and precise forms for the “possible institutionalization of BRICS, including consideration of creating a permanent secretariat;” (5) and developing the association’s external relations, establishing a dialogue with the leading developing countries, the UN’s specialized institutions, and regional organizations. Thus, after this period, Putin seems set on institutionalizing BRICS as it emerges as ‘major factor’ in international affairs. BRICS should be capable in one form or another of asserting a joint BRICS position on the full-range of international issues. It is likely that the first stage of institutionalization and creation of a secretariat and perhaps other bodies will be pursued no later than Putin’s likely fourth term as president beginning in 2018, if not sooner. This could be followed by a further politicization and even ‘securitization’ of BRICS, having the association become more involved in international and regional political and security issues. The importance Putin puts on BRICS’ further development and institutionalization is reflected in Moscow’s promotion of research on the economies and foreign and domestic policies of BRICS members, the creation of a field specializing in the study BRICS as an international association, the formation of a National Committee for Research on BRICS, and the development of country and language expertise relevant to BRICS member-states as a priority task for state institutions of higher education. Russia is in a unique position, since Moscow chaired the G20 and hosted its summit in St. Petersburg in 2013, will chair the G8 and host its summit in Sochi this year, and chair BRICS in 2015. The outcome of these three chairmanships could be pivotal in determining which of these associations Russia makes a priority. Given Russia’s worsening relations with its G8 partners over issues such as Syria, Ukraine, arms control, missile defense, and Russia’s internal human, civil, and political rights, Moscow is finding itself increasingly marginalized and frustrated within this Western-oriented association. Because of these tensions and Russia’s multi-vectored foreign policy approach, Russia will be using BRICS as a lever for strengthening the G20 and the influence of non-Western powers within it in order to shape or even supplant the G8 as the chief association of economic superpowers. Thus, Moscow was able to use last year’s G20 summit in St. Petersburg in order to lay claim to status of spokesman and policy leader of the non-Western powers by steeping up to resolve, at least temporarily, the Syrian chemical weapons crisis and postpone a U.S. military strike with unpredictable consequences. Should Moscow’s relations with the West suffer a complete breakdown and Russia is expelled or abandons the G8, a split within the G20 would become very likely. In this event, BRICS could be used by Russia and may already be viewed in Moscow as the nucleus of a reserve, alternative international association for countering the G8 and the West to include its possible long-term securitization along the lines of SCO. Finally, Moscow is likely to seek the expansion of BRICS’s membership. Its first expansion proposal is likely to include the inclusion of a predominantly Muslim country in BRICS. Top candidates would include Iran, Turkey, Egypt, and Indonesia. Moscow’s recent agreement with Cairo to integrate Egypt into the Eurasian Economic Union – a far less suitable institutional venue for Egypt to share with Russia than BRICS given the two organizations’ geographical profiles – suggests this direction. Moscow’s initiation of a proposal to include an Islamic country in BRICS would serve both domestic and foreign political goals for Moscow. Domestically, it will support Moscow’s efforts to buttress regime legitimacy and socioeconomic modernization among Russia’s Muslim peoples and regions, by demonstrating Moscow’s respect for Islam and opening up additional avenues for trade and cultural relations between Russia’s Muslims and those abroad. Internationally, such an initiative will demonstrate Russia’s respect for Islamic countries at a time of strained Russian relationships with many, especially Sunni-dominated states. Moscow might place two Islamic countries on the BRICS membership agenda in order to balance the Shia and Sunni Muslim worlds. BRICS is an expression of Moscow’s multi-vectored foreign policy and preference for a multipolar international system in which the US and the West form but one pillar in the system’s structure. The practical importance Russia gives to BRICS is driven by complications in Moscow’s relations with the West and the Kremlin’s determination to consolidate Russia’s position as one of the central pillars of the global power structure – a goal Moscow sees the West as thwarting objectively if not subjectively. Moscow is likely to use its 2015 BRICS chairmanship to pursue upgrading, institutionalizing, and even ‘securitizing’ BRICS as laid out above. To the extent that US-Russian and European-Russian relations continue to deteriorate, Moscow might even seek to militarize BRICS as it did with the SCO or at least seek to use the association to deepen military and geostrategic coordination with some of its BRICS partners on a multilateral or bilateral basis. Finally, it is safe to assume that Russia views BRICS as a forum through which it can expand bilateral trade opportunities and pursue privileged relations with BRICS partners to help it compete with the West and globally. Finally, it should be remembered that President Putin inclines towards gradualism in his pursuit of goals and implementation of tactics and strategy. Therefore, despite his ambitious plans for BRICS and Russia itself, it can be expected that Moscow will move slowly but deliberately in its efforts to transform BRICS into a robust and major international organization. Russia’s Foreign Policy Concept mentions BRICS only twice more. This is in regard to Russia’s relations with two regions of the world and their respective top regional powers: Asia/China and Latin America/Brazil. Thus, India and South Africa might play less of a role in Russia’s plans for its activity within BRICS than do China and Brazil. Gordon M. Hahn is an Analyst and Advisory Board Member of the Geostrategic Forecasting Corporation; an Analyst/Consultant for Russia Other Points of View – Russia Media Watch; Senior Researcher and Adjunct Professor at MonTREP, Monterey, California; and Senior Researcher for the Center for Terrorism and Intelligence Studies (CETIS), Akribis Group, San Jose, California. Dr. Hahn is author of three well-received books, The Caucasus Emirate Mujahedin: Global Jihadism in Russia’s North Caucasus and Beyond (McFarland Publishers, 2014), Russia’s Revolution From Above (Transaction, 2002) and Russia’s Islamic Threat (Yale University Press, 2007), which was named an outstanding title of 2007 by Choice magazine, and the forthcoming The ‘Caucasus Emirate’ Mujahedin: Global Jihadism in Russia’s North Caucasus and Beyond (McFarland Publishers, 2014). He has authored hundreds of articles in scholarly journals and other publications on Russian, Eurasian and international politics.